Add a glam touch to your decor with this crystal and brushed nickel table lamp. A beautiful crystal body and a stunning brushed nickel bottom base make this modern style table lamp truly eye-catching. 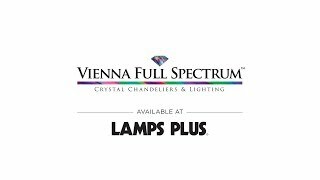 Complete with a white shade, this Vienna Full Spectrum lamp also comes with easy-to-operate twin pull chains. 26" high overall. Bottom base is 8" wide. Drum shade is 16 1/2" wide x 9" high. Weighs 7.7 pounds. Uses two maximum 60 watt standard-medium base A19 bulbs (not included). Twin on-off pull chains. 8-foot long clear cord and plug. Modern table lamp from the Vienna Full Spectrum brand of lighting. Crystal glass lamp body. Brushed nickel finish accents and bottom base. White-ivory fabric lamp shade with a brushed nickel finial. Perfect for a secondary bedroom. This lamp has the brushed nickel and two bulb look that I was searching for, but it will look even better with the crystal in our sun-filled room. With a minimal design and beautiful brushed steel and brushed nickel finishesthis table lamp is perfect for contemporary homes.